On Wednesday night, myself and R. headed to Sobogusto for a wine tasting event organized by Bernard-Massard. The concept is repeated once per month, every time with a different wine region. For a 20 euro fee, you get access to the full wine tasting and to a buffet of various food. The event starts at 6 pm and last normally until 9 pm. Reservation is mandatory as they got only 100 places. This month was the turn of Cotes du Rhone. I have been at Sobogusto, that is situated in Hollerich area, just next to P+R Bouillon, couple of years ago – I was not impressed by the food (it was fine, but nothing great), but I really liked the atmosphere and the place (trendy, chic, spacious), so I was really looking forward to come back. We got there at 7ish and were accompanied to the Chalet upstairs and assigned to our table. We tasted 1 cremant, 1 white and about 6 red wines. 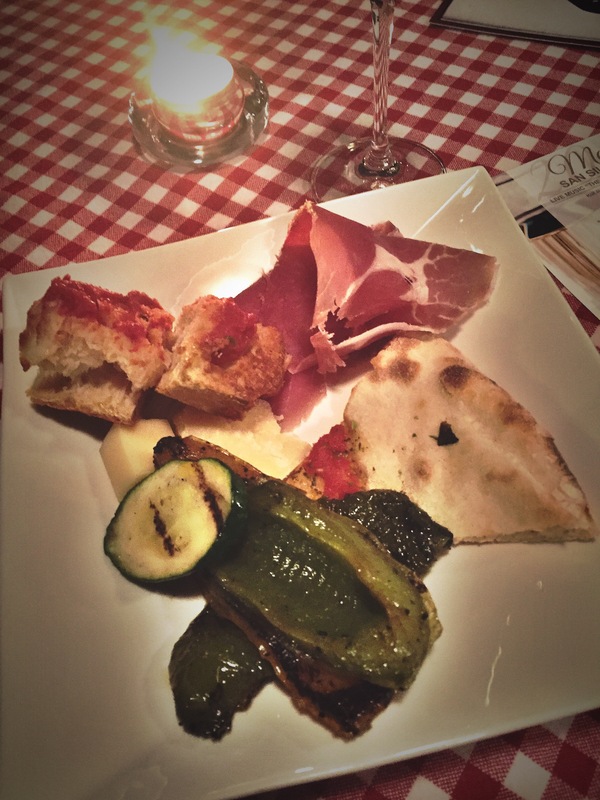 The buffet had several charcuterie types, cheese, pizza and bread and grilled vegetables. The evening was very pleasant. The event was very well-organized. You reserve, so you have your table, the buffet is huge and well assorted and two people were serving the wine, so no queuing involved at all. Each wine was also shortly presented by Bernard-Massard guys. The atmosphere was relaxed, polished and sophisticated. We enjoyed from the first to the last-minute. Service was great and wines lovely. You got a chance to try different kind of wines of different budgets and you can buy them at the end if you want. 20 euro are definitely fair for what we drank and what we ate. The buffet included also bottles of water, so no hidden costs, very appreciated.. When I booked at Sobogusto I supposed to be AT Sobogusto, not at the Chalet on the first floor. It was still fine, but I personally prefer the atmosphere on the ground floor. 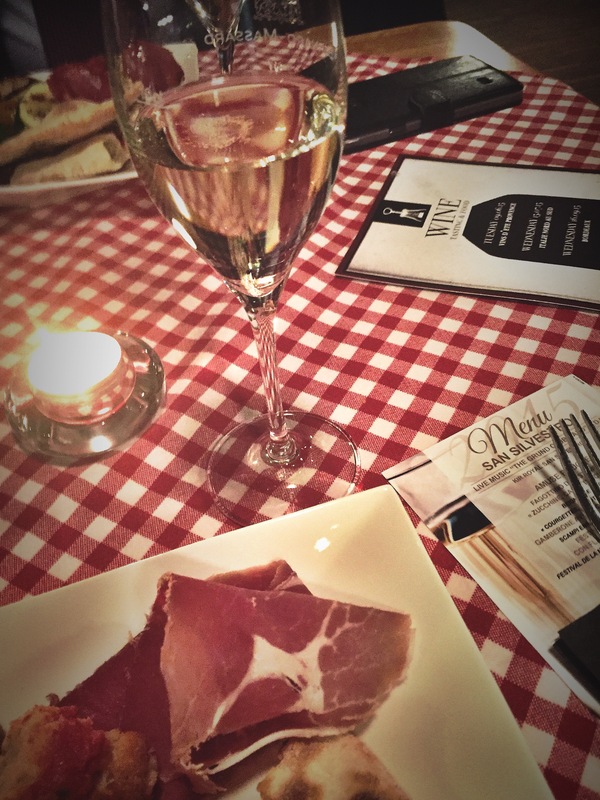 To conclude, we spent a nice and alternative evening at Sobogusto for the wine tasting event. You get a chance to try several great bottles, have some cheese/charcuterie and enjoy a relaxed environment. If you are interested in the event, next month it will be “Vin du fete“. The concept is really cool and I might come back in the future. Bonjour ma belle! It’s always a pleasure reading your posts! Thanks for sharing! As for their food,sometimes I absolutely adore it and sometimes it’s a bit disappointing, guess it depends on the cook’s mood.